It’s not like I have much influence, but I want to give a quick shout out to three pieces of software that I’m finding useful in the lab: DokuWiki, Evernote, and Dropbox. Dokuwiki, I’ve mentioned before; I use it as my electronic lab notebook. It has all the standard Wiki features – easy lnks, images and text — with the major advantage over several other wikis that the pages are essentially stored as plain text, making backups, searches, and futureproofing relatively easy. A little rsync magic means that the version on my laptop is auto-synced to a remote copy for backup. Evernote is a note-storage service. It has a web interface and desktop apps for Mac and Windows, as well as iPhone integration, and it has useful gimimicks like OCR that can make handwriting searchable text. The iPhone integration is what turned this from a mildly useful service to one I use every day. 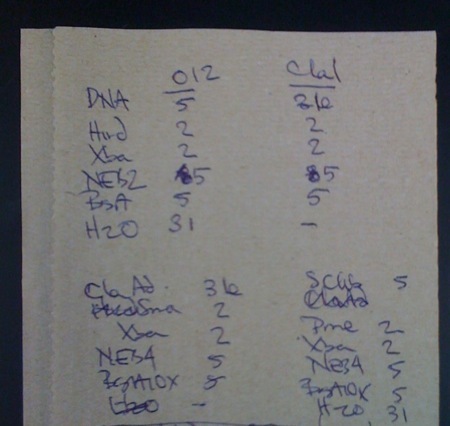 All the scribbled notes I make to myself in the lab, I now take snapshots of; they’re dumped into Evernote, and then when I write up the experiment, or when I’m replicating it, I have exactly what I did at my fingertips. 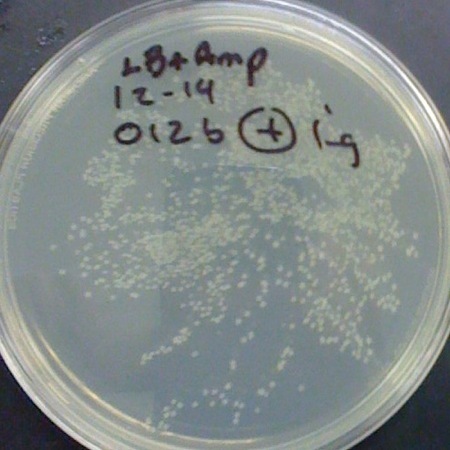 And for things that otherwise take a thousand words (like the number of colonies I get from a transformation of a particular ligation), a photo can be a better explanation. Dump the photo into Dokuwiki, and I don’t have to wonder if “LOTS OF COLONIES” means a hundred, or what. Dropbox is file sharing. Put a dropbox folder on your computer, and anything you put in that folder is silently and promptly synced to any other computer you use — Mac, Windows, Linux. Even more usefully, symlinks work; take any folders you’re working on, and put symlinks to them in Dropbox, and forget about anything else. Any time you work on a file or add anything new, the changes are intantly synced and made available on all the other machines. There’s no iPhone client, yet, but iStorage and similar iPhone apps work beautifully with it; so I essentially have my entire computer in my pocket all the time. But that’s not what makes it so useful in the lab. It also allows folders to be shared between different people. That means that for relatively large files and folders (flow cytometry runs in the 100 MB range, confocal experiments that are two or three times that) my students and tech don’t have to fuss with compression and emails and hunting me down with flash drives or whatever. Just drop the experiment in the shared Lab Folder on any of the computers, and a moment later it silently appears on my laptop. My collaborator in Greece and I are editing a grant application; it’s in our shared dropbox folder, and whenever he makes changes they’re instantly reflected on my machine, and vice versa. All three of these are freeware, though Evernote and Dropbox have paid versions with higher capacity. I haven’t needed them yet, but probably will eventually, and they make my life easy enough that I’ll be happy to shell out for them. This entry is filed under Computers, Miscellaneous. You can follow any responses to this entry through the RSS 2.0 feed. Both comments and pings are currently closed. Our lab was analyzing some microarray and RT-PCR data recently, and Dropbox was essentialy to coordinating and syncing our latest analyses between all of us. Hey thanks those softwares sound like exactly what I need. I’ve been generated loads of electronic data these days with no good way to organize it. Couldn’t agree with you more about Evernote. I don’t know how many times people asked me “what were the PCR conditions you used?” Then I all had to do was type in a little about what I remembered I did to find the rest. I know this is older, but i’m essentially using the same combination as well. How do you decide which data goes into dokuwiki vs evernote. I’m thinking to use evernote as the main gathering station, and then funnel to dokuwiki as necessary in an organized fashion. I also use DokuWiki as my lab notebook for PhD research. It is great for the reasons you mentioned. I also have the jsMath plugin installed. At the end of the day or the end of the week, I print that week’s entries to PDF so I also have an easy system to print for anyone else. Dropbox is also great because I scan class notes and I can store them where I can get them from my iPhone. I do not yet use evernote but I use simplenote. Not so much for research per se but for todo and other lists. Finally, I also use CVS to keep track of code. May switch to SVN in the future but my prof uses CVS so I am stuck. I’m still looking for a perfect to-do solution. I want something that integrates iCal, web, and iPhone seamlessly. I already have this working for my calendars, but the to-do component seems to be harder. I have the iPhone/iPad apps “Todo” and “2Do” and I like them both reasonably well (with some caveats — e.g. the ToDo desktop sync component has a memory leak that leads to my computer bogging down at intervals), but I haven’t found a web component to them that I’m really happy with. I’m probably fussy; I’ve looked at Remember the Milk and Reqall and a whole bunch of others and just haven’t been overwhelmed by them. i’ve been through a lot of different task management systems and I think for me, a combination of Personal Kanban (using Kanbanery), and the Pomodoro Method work well for me.